The announcement Tuesday that Peter Konwerski, the vice provost and dean of student affairs, would be leaving his role at the end of the month and likely GW at the end of the spring semester drew mixed reactions from students. For nearly a decade, Peter Konwerski was a near-ubiquitous presence on campus. From responding to late-night Twitter gripes about plumbing in residence halls to showing up to student group events and holding meetings about everything from student health to Greek life, Konwerski, the vice provost and dean of student affairs, was one of the most well-known administrators in Rice Hall. The announcement Tuesday that Konwerski will be leaving his role at the end of the month and likely GW at the end of the spring semester drew mixed reactions from students. Konwerski said while he has been “inspired” by University President Thomas LeBlanc’s focus on the student experience, he decided the transition to a new president was the right time for him to make a change. 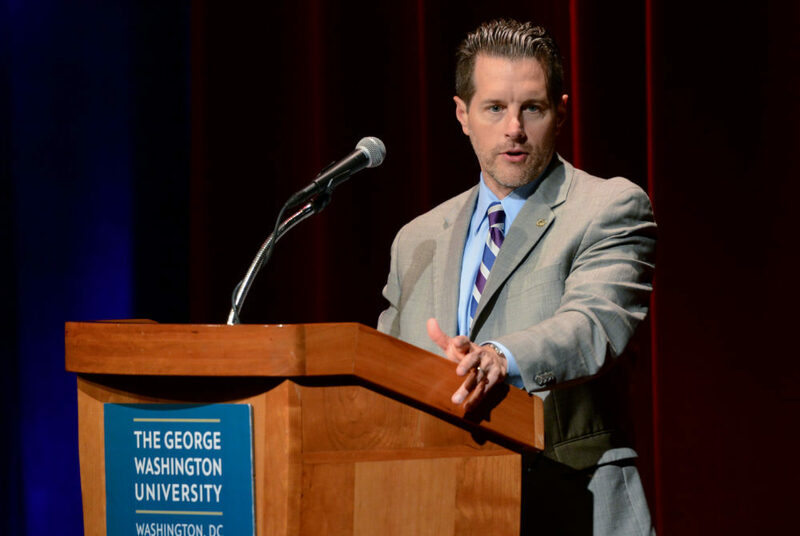 Konwerski, who celebrated his 25th anniversary working in student life at GW in September, said he had been considering stepping down for the last several weeks. He said he would explore other opportunities in higher education or nonprofit work but does not have another position lined up. He is being retained as a special adviser on the student experience to LeBlanc and Provost Forrest Maltzman for the spring semester. Experts said it’s not unusual for top administrators to leave when a new president arrives on campus and Konwerski’s resignation would give LeBlanc the opportunity to find his own student affairs leader – at a time when improving student satisfaction is one of his highest priorities. Maltzman said officials will create a committee early next semester to begin the search for Konwerski’s replacement. Robert Chernak, the University’s former senior vice president for student and academic support services, said Konwerski was an “institution” at GW, but after a quarter-century he might have decided that he didn’t want to adapt to another president and a new philosophy. Konwerski was a GW staple, a three-time alumnus that has lived or worked on campus since living as a freshman in Thurston Hall three decades ago. He went on to work in various student life roles at the University before being named to the top student affairs position in 2012. Konwerski said he and his team at the Division of Student Affairs have been able to improve the campus community by increasing community spaces and taking advantage of the ever-growing number of campus student organizations. During Konwerski’s tenure, officials have opened student spaces in new residence halls like District House, which opened in 2016, and the new “living room” area set to open on the first floor of the Marvin Center next month. Konwerski spearheaded the effort to revamp the Center for Career Services, helping to double the funding for the center to hire more career coaches. The effort launched new programs and has led to a 50 percent increase in student use of the center since 2013. After a student push, Konwerski oversaw the plan to create the Colonial Health Center, which opened in the Marvin Center in 2015, merging mental and physical health services in one unit. He also helped start the CARE network in 2012, giving students the opportunity to anonymously report peers struggling with mental health issues. Among students, he became famous for using his @GWPeterK Twitter account to respond to student complaints, highlight student achievements and relentlessly promote “#OnlyatGW” events. Konwerski and DSA also faced budget cuts during his tenure and an at times tense relationship with students. Former University President Steven Knapp announced a far-reaching round of budget cuts in 2015, requiring administrative units to slash budgets each year for five years. The cuts forced the DSA to merge units, giving administrators oversight roles in several different offices simultaneously. Konwerski was put at the center of a campus-wide firestorm about the University’s response to sexual assault last spring when alumna and survivor Aniqa Raihan accused him and other officials of mishandling her sexual assault case in a petition that has garnered more than 2,400 supporters. At a rally in April organized by Students Against Sexual Assault, survivors chanted, “Peter K., you’re no good, support survivors like you should.” Protesters also called for Konwerski’s resignation. He denied that his resignation was at all related to the controversy over Raihan’s case. Konwerski said every dean of students across the country is dealing with pushback from issues like sexual assault response. The controversy showed that students are engaged in “really important issues,” he said. Konwerski’s resignation is the fourth such move by a top leader in the DSA this semester, making unclear who will step in to fill the open seats in an office plagued by turnover. The former director of the Colonial Health Center resigned unexpectedly in September and the former director of the Office of Student Rights and Responsibilities departed from the office last month for active-duty military service. The associate director of the Office of Military and Veteran Student Services also left her post last month. No replacements have been announced yet for these roles. Experts said the high turnover could leave the office with an opportunity to better the student experience. The Board of Trustees launched a student experience task force in August, an effort that has heavily involved Konwerski. But he said it is unusual for so many DSA officials to step down in the middle of the school year. “It would seem like that kind of turnover in student affairs in particular could be destabilizing,” Marthers said. Larry Lunsford, the vice president for student affairs at Florida International University, said high turnover allows University officials to take a step back to “regroup, reorganize.” He said departures can be a negative if they are the result of low motivation or salaries, but that moving on to new opportunities is normal. “The high turnover is a pro to give them an opportunity to take a look at where they are and where they need to go – you know, what’s the vision?” he said. Justine Coleman, Annie Dobler, Kylie Fronczak, Kelly Hooper, Kate McCarthy and Lizzie Mintz contributed reporting. This article appeared in the December 4, 2017 issue of the Hatchet.